The ballpoint pen was invented 128 years ago. Since then, things have stalled a little bit. I guess it’s hard to innovate on something so fundamentally simple like a writing implement. This pen is for more than merely writing notes. It does much, much more, and comes with a built-in 16GB USB flash drive, a 1,000 mAh battery, and a stylus attachment for use with touchscreen devices. I’ve been using the Beyond Ink almost exclusively for a couple of weeks now. As a writing implement, it excels. This is thanks to it being based on the fantastic Lamy ballpoint pen. For those reading who aren’t pen nerds like me, Lamy is a high-end German manufacturer of stationery. Although relatively expensive , they make up for their high price point with exceptional build quality. 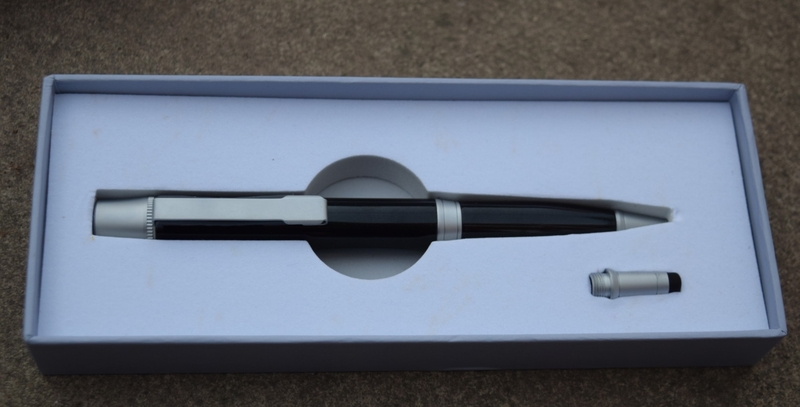 I prefer chunky pens to slim one and as such, I’ve a bias towards the Beyond Ink. Built out of brass and aluminium, it comes in a hefty 71 grams and is undeniably girthy. As a result, some may find that using it takes some getting used to, especially when you compare it to, say, a comparatively lithe Bic pen. But this shouldn’t put you off. In my own experience, I found it to be smooth and precise, and above all comfortable to use. Pairing it with a Moleskin ruled notebook was penmanship heaven. The unique selling point of Beyond Ink is that it comes with a whole bunch of added extras. These are things that you might forget at home, or at the office. So, why not converge them into one coherent device? First, let’s look at the battery charger. 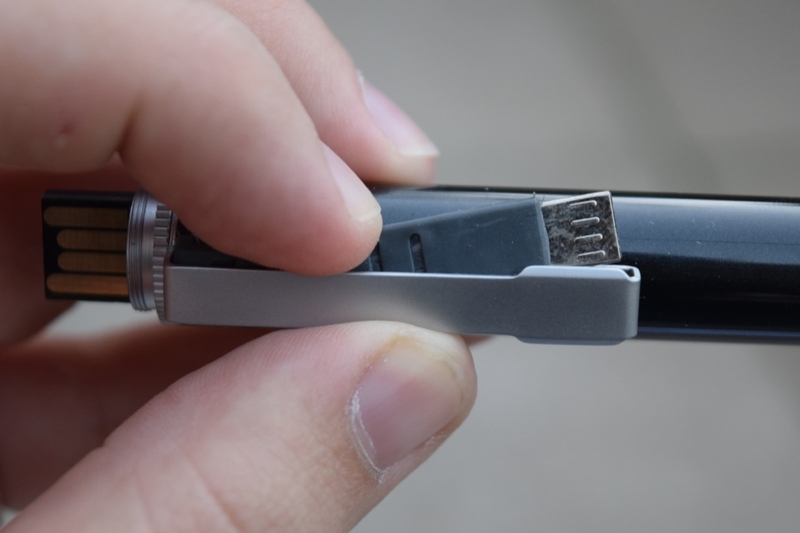 The Beyond Ink packs a 1,000 mAh rechargeable cell into a relatively small space. I should state the obvious. 1,000 mAh really isn’t all that much. There are affordable portable batteries that offer over twenty times that. It’s worth emphasizing that this is unlikely to charge your phone to full capacity. The Samsung Galaxy S7, for example, has a 3000 mAh battery. But what the Beyond Ink does give you is a few extra hours of talk time until you can find a wall socket. And given the fact that it’s packed into such a tiny space, you can understand its relative lack of capacity. Beyond Ink comes in two different variants. There’s one with a lightning cable for iPhones and iPads. There’s also one with a bog-standard MicroUSB connection for everything else. The model I reviewed is the latter. My biggest frustration with the device’s charging features is the cord. This comes discretely hidden behind the pen’s clip. But it’s just too damn short. It also required a fair bit of contorting in order to plug into my phone, and was prone to falling out. It’s handy, but Beyond Ink’s portable battery feature shouldn’t be considered as a replacement for the real thing. As previously mentioned, Beyond Ink comes with 16 GB of built-in flash storage. To access this, you have to unscrew the top. 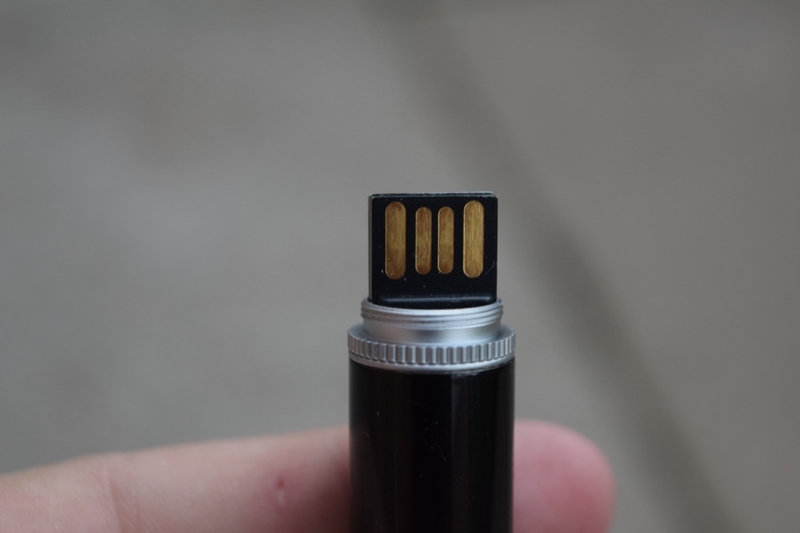 This reveals a reversible USB connection, which is also used to charge the device’s built-in battery. There’s not much worth saying about the USB drive itself. You shove it in. You copy files to it. You inevitably forget to safely eject it before unplugging it. It’s all very straightforward. The Beyond Ink is a great pen. I mean it. It’s comfortable and extraordinarily well built. It’s heavy, but not too heavy. It’s precise. I love it. But as a USB flash drive and battery, it’s merely passable. First, let’s talk about the battery. Here, I can forgive it for its flaws. There’s just not all that much space to cram in much capacity. That said, it lacks the endurance you’d need in order to throw away your standalone battery charger, which defeats the point of the Beyond Ink somewhat. The built-in USB flash drive works fine. But I felt that it was undermined by the pen’s form factor, which simply isn’t conducive to being used as a flash drive. Similarly, the stylus worked just fine. 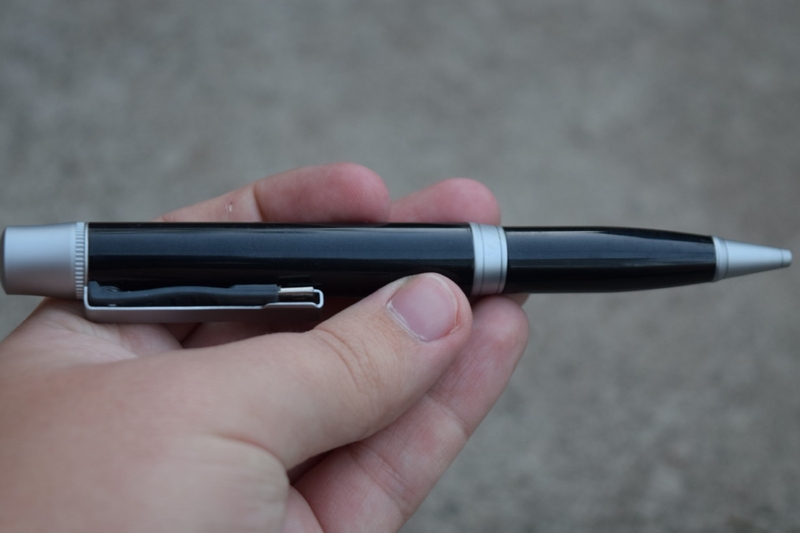 But the fact that the pen doesn’t include a space to store the stylus tip felt like somewhat of liability. As a manufacturer, we also make the use of its unique personality, designed a reading pen.Reading pen using the latest optical image recognition technology and advanced digital voice technology developed a new generation of intelligent reading and learning tool. It embodies the perfect fusion of electronic products and education industry, and technology to people centered concept.